Tom Wood is a man on a mission. Butchery is more than just a profession for Tom Wood, it is his passion. And it is one which has taken him from his family’s abattoir to top international butchery competitions on the other side of the globe. 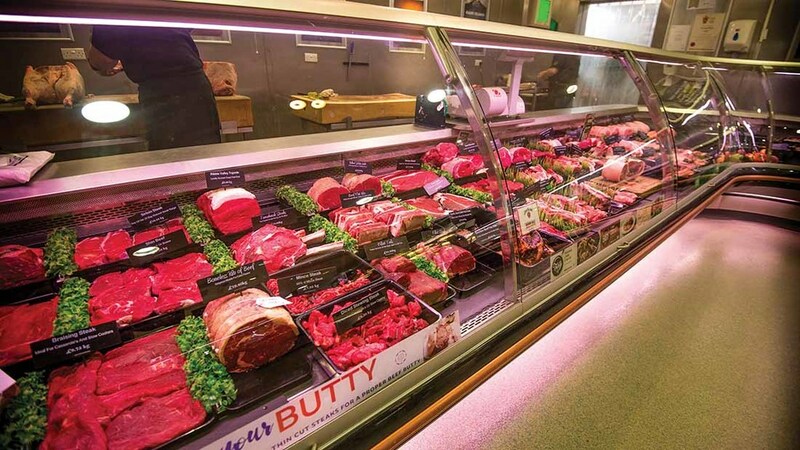 Currently the head butcher and manager of the meat counters at Huntley’s farm shop, Samlesbury, Lancashire, he has helped transform the fortunes of the shop and developed a 21st century offering for the popular business. Backing up face-to-face sales patter with a host of social media profiles across Twitter and Facebook, he has a knack for self-promotion and eye for detail when it comes to presenting his products to the public. “Butchery and the presentation of meat is an art form in my eyes,” says Tom as he drinks a coffee in the site’s large farm shop and cafe. “You have to respect the meat and present it in the right way. 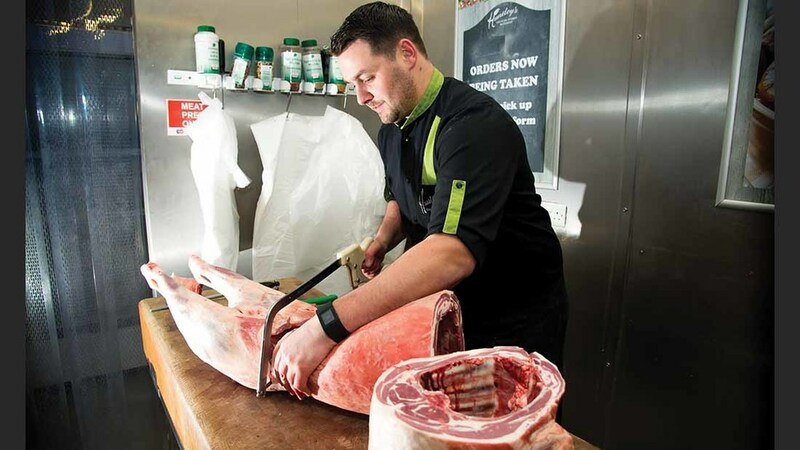 Tom, 37, has been at Huntley’s, owned by farm machinery contractor Harry Wilson, for the past four and a half years and has transformed the fortunes of the butchery business. In his first year as manager he has grown the sales of this part of the business by 30 per cent, increasing them by a fifth last Christmas. Acknowledging the influence of his dad, renowned Simmental breeder and owner of Bowland Foods Jimmy Wood, Tom says he has taken the skills and respect for meat he picked up as a youngster and transferred them in to what he does today. And he believes having an eye for detail is key to keeping on top of changing trends set by the meat-buying public. He says: “There is a backlash against supermarkets and people want the knowledge butchers can provide about where the meat comes from. This is a big part of what we do. I believe you can tell by the touch and texture of the meat how you should be cooking it, and this is something we pass on. Having worked for George Alpe butchers, Clitheroe, when he first left school, he then joined his dad at Bowland Foods and spent 13 years there during a time in which the farming industry saw massive changes, and what people wanted from their meat also shifted. Sourcing most of his meat from Bowland Foods, he is keen to support British farmers and he believes you have to keep an eye on what customers want and cater to their needs. “The cuts and pieces of meat they want now are much smaller than they were. You have to be more innovative with your products as consumers are changing and the old family ways of sitting down on a Sunday for a big roast are going. With the rise in popularity of steaks cuts such as flat iron and pichana, the rump cover, and lamb cuts such as paves, rectangular thick cuts, Tom is clear the industry cannot afford to be precious about fitting products to meet the changing lifestyles of the public. “Mid-week joints fit in with busy lifestyles and allow people who do not want to be cooking for a long period of time to fit something in round them. They want us to do the work for them and even season the piece of beef or lamb, but we have to do it. As well as changing lifestyles and eating habits, Tom has also tapped in to what social media can do for a business. With a range of social media profiles on Twitter and Facebook, he is regularly found posting images about the different cuts he is championing, or speaking about the role of British products in his business. With no hesitation to showcase what he is doing, he understands this is essential to bring a new audience, and also, potentially, a new workforce. With young, would-be butchers contacting him on Facebook and asking for work experience, he believes engaging with the next generation of butchers is key, not only for Huntley’s but also the industry as a whole. A fully qualified butchery assessor, he wants to get younger men and women in to the trade, although he acknowledges the challenges it can pose. He says: “It can be difficult to get the youngsters in because younger people do not always want to do physical graft. They want the nice clothes, image and lifestyle but do not make the connection they have to work for it. We have to create this professional image as a job in order to make them want to become a butcher and get started in the industry. His passion for his job has also led to worldwide travels in recent years as part of the Great Britain butchery team, competing in the Tri-Nations challenge against southern hemisphere opponents. With trips to New Zealand and Australia under his belt, it is a long way from the Bowlands Foods abattoir in Great Harwood, Lancashire, where he started out. But he grasped the opportunity with both hands. “I saw the advert for the British team but someone I worked with said I was not ready to make the step up. Still, I decided I would show them and went down to London for the trials at Olympia. “Being a typical farmer’s son, I had never been to London before and was nervous, but I managed to come in the top five out of 35 butchers from across the country. “It was a massive thing for me and really put fire in my belly to crack on in this profession. And he is adamant he will keep forging ahead and promoting British meat at the same time, no matter where he finds himself.